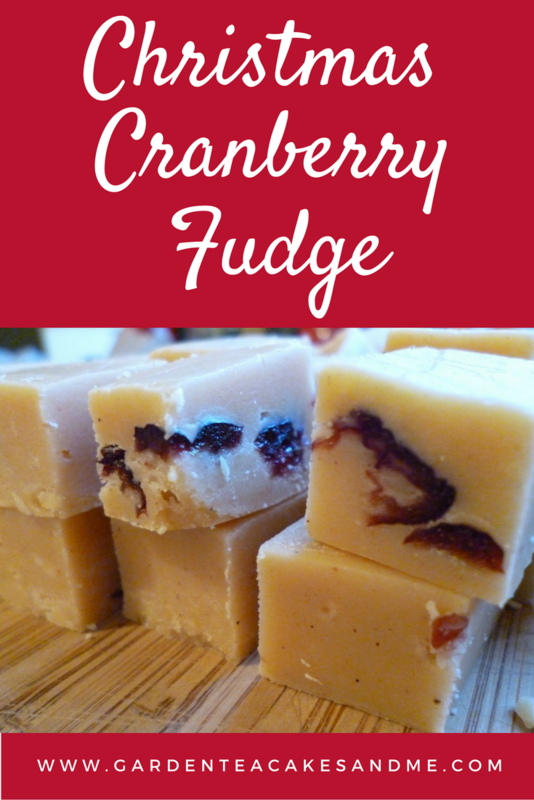 Here is an easy recipe for Christmas Fudge. But what is it that makes this fudge Christmassy? I have replaced some of the caster sugar with some flavoured icing sugar, Christmas Punch from Sugar and Crumbs. I also added a handful of dried cranberries. I was a little unsure how it would taste as this was the first time I have used the flavoured icing sugar. Although I did enjoy the taste at Cake International show in November where I first discovered it. I used a different recipe to my usual, using condensed milk. 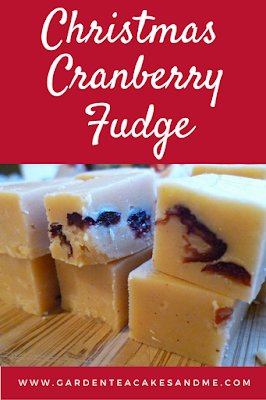 A recipe from Nestle's website but with a few changes to make it into Christmas Fudge. I did not use a thermometer or even the dropping some of the fudge is a glass of cold water method and it still worked perfectly. I was very pleased with the result both in taste and texture, and it was well received by all who tasted it. I will be making more of this tasty fudge to parcel up as Christmas foodie gifts. Place all the ingredients except the cranberries into a heavy bottomed saucepan. Melt over a low heat until all the sugar has dissolved, keep stirring. Bring to the boil (keep stirring) then simmer for 10-15 minutes again keep stirring do not let the fudge catch on the bottom of the pan. Remove from the heat and add the dried cranberries. Continue to stir for 10 minutes, the fudge mixture will start to thicken. Pour into your tin before it gets so thick you can not pour it. Leave to cool. Once cooled lift the Christmas Fudge out of the tin using the baking parchment and cut into cubes. For something a little different why not soak the cranberries in Port. I am linking this recipe with two Christmas baking challenges. Cakeboi's Treat Petite hosted this month by The Baking Explorer, also Alphabakes hosted by Caroline Makes and The More Than Occasional Baker, for which purposes this Christmas post is Xmas. These look great and sound really delicious and festive. Thanks for entering AlphaBakes. Love fudge - one of my guilty pleasures. This sounds amazing and so christmassy. Yum I love fudge and this looks so scrumptious! Thank you for entering into Treat Petite! I'm hopeless at making fudge, it always ends up runny, so I am impressed with this! I like the idea of using the flavoured icing sugar, I bought some of that in saled caramel flavour at their stand at the Cake and Bake show but I haven't used it yet. Thanks for linking up with Alphabakes!